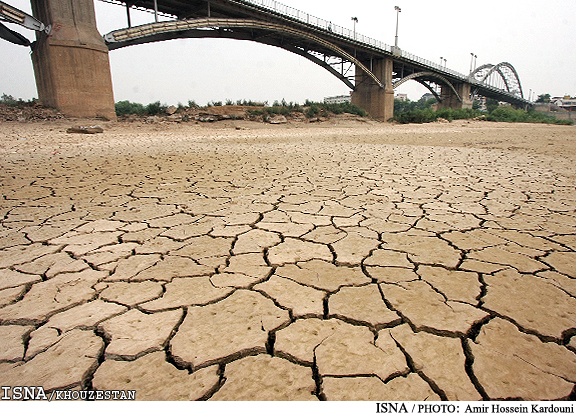 Khuzestan province is facing an unprecedented ecological crisis that is affecting drinking water and agricultural irrigation, said Majlis member for Ahwaz Sayed Sharif Hosseini this week. Hosseini is seeking to bring national and international attention to the drought problems that have seen the region's once mighty rivers dwindle to a trickle. 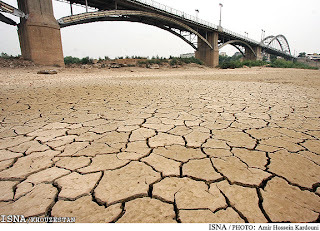 In an interview with the Iranian Students' News Agency, he said: "Khuzestan used to have a third of the country's water resources with five major rivers. Today we are facing a disaster in terms of shortage of clean water and water for agriculture." This has reduced the area covered by farming as well as crop yields and quality. The situation has been worsened by the government's refusal to provide chemical fertilisers to farmers, he claimed. Hosseini, leader of the Majlis members from Khuzestan, has previously threatened that all 18 deputies from the province would resign if the government completed its plans to divert water from the Karoon River to other parts of the country. The government's plans, already under development, would siphon off 1.1bn cubic metres of water from the province's main rivers to central Iran, a move that Hosseini has said would represent "the death of Khuzestan." The impact of the water diversion project may have had a role in the massive decline in the production of wheat, a source of animal feed. Iran has this year faced escalating costs for chicken, a major source of protein in the national diet, due to animal feed shortages. This prompted protests throughout Iran during Ramadan. Khuzestan is Iran's second largest wheat-producing province, but has seen wheat output halve this year. Around 62% of the province's wheat production is reliant on irrigation, utilising water from its rivers. According to reports, wheat production has declined by up to half this year, due primarily to water shortages. "Humanitarian efforts are ongoing in Basra Province to counteract the effects of diminished and ineffective water treatment capabilities due to the high salinity concentrations." Other major problems highlighted by Hosseini include air pollution, which has increased asthma rates by 17% in the province. Ahwaz City is recognised by the World Health Organisation (WHO) as the world's most polluted city.